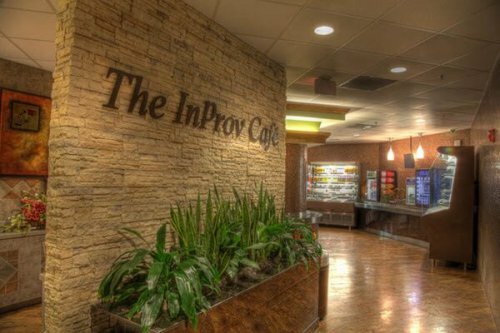 The InProv Café/Dining Room is located on the first floor of Ascension Providence near the main entrance and offers a wide variety of entrees, sandwiches, desserts and beverages for your dining pleasure, including a fresh salad bar and grill. InProv Cafe’s website offers information about wellness, menus, daily features, promotions and more. Dinner 4:30 p.m. – 6:30 p.m.
Dinner: 4:30 p.m. – 6:30 p.m.
ToGo’s, located just off the main lobby, is the perfect place to find a variety of sandwiches, salads, specialty coffees and desserts all available to go. Hot meals also available 7 days a week on our Midnight Meal menu. ToGo’s is open 24 hours a day, 7 days a week. Have a pizza craving? ToGo’s can help. Call us at 254-751-4000 x2292 for freshly made-to-order pizzas ready for pickup! !